We're now seeing the first practical applications of of Artificial Intelligence (A.I.) in construction. As construction sites become increasingly digitally connected and as datasets grow, the question is not if AI will impact construction, but how an industry with relatively low levels of innovation can take advantage of a rapidly improving AI toolkit. Every day we hear news about new applications of A.I., machine learning and deep learning, all related terms, often used interchangeably. They describe a series of technologies which are creating both excitement - and confusion. A.I. has often been used as an overhyped marketing buzzword, we hear about robots taking our jobs, and the dystopic risks of intelligent machines have even been touted as potential threats to civilization by high-profile technologists. But A.I. is also foundational to step-change improvements in how computers can interact with the world and solve complex challenges. So lets start by talking about what A.I. is - and what it isn't. When we say A.I., we're using a blanket term to talk about algorithms that can be focused on problems which, up until recently, could only be solved by human intelligence - like speech and image recognition, language translation or how to win a chess game. Machine learning refers to a specific form of A.I. which can be trained to recognize patterns and make better decisions with more inputs - it can learn without being explicitly programmed to do so. Amazon's book recommendation engine is a well known example that looks at all of your past purchases and recognizes what you're likely to want to read next. Deep learning is a sub-category of machine learning using multiple levels of abstraction to organize inputs into accurate categories, for instance recognizing that an edge in an image is part of an eye, which belongs to a face, before deciding whom the face belongs to. 1. The rapidly falling price of parallel computing which lets artificial neural networks (the mechanism behind machine learning) perform multiple operations in parallel. 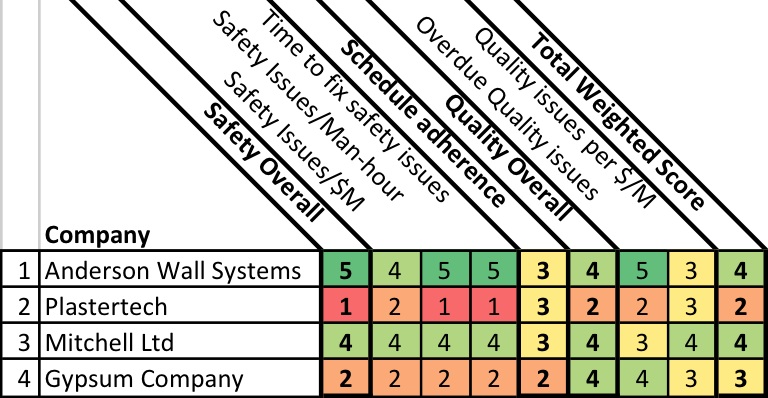 Graphics processing units (GPUs) are examples of neural networks. They can see a pixel of an image in relation to all the pixels around it, and can thus make classifications based on complex patterns. When running in the cloud, GPUs can recognize your friend's face in an image uploaded to Facebook and make millions of 'tag suggestions' a day. 2. Better algorithms, such as a tweak to hierarchical pattern recognition that enabled what we now call deep learning. When this algorithm was applied to Google's online translation service in 2016, its error rate fell by 60% overnight. 3. Big data and a widely available set of data sources. Think of a toddler - the more chairs he sees, the better he'll be at identifiying a chair next time she sees one. A.I. needs exposure to a very large quantity of data to accurately identify patterns, classify inputs and to solve the problem its being trained on. We're not (yet) talking about super-intelligent builder-robots which execute designs generated by algorithms, but even some early explorations of this are underway and could be indicative of future engineering trends. But let's save that discussion for another day. Nowadays, a construction site manager with a mobile device can quickly capture photos, videos and updates to the latest project conditions (models, drawings, schedules). The latest media and data is uploaded to cloud-platforms, where it can be analyzed at a project or cross-project level. These data-sets will continue to grow exponentially as the cost of drones, laser scanners, wearable cameras and other data collection devices falls, as mobile-apps for construction add functionality, and as technology becomes adopted by more and more project team members. Smartvid.io lets users upload photos, voice and video recordings to their platform, where their A.I. engine VINNIE then looks at and listens to the media to place smart tags on images and audio. Thanks to this automatic tagging, contractors can later accurately sift through gigabytes of media taken on a typical project to find exactly what they're looking for. In some cases builders can find documentation that protects them against a claim, saving of millions of dollars. It's not just precise, it's quick too. In 2016 Engineering News Record (ENR) hosted their annual photo competition, but this time they partnered with smartvid.io to make sure none of the pictures depicted hazardous safety situations on-site. Alongside human safety experts, VINNIE scanned through the more than 10,000 photos in under 10 minutes - the same task took the human judges over 4.5 hours. What's more, VINNIE correctly identified 10% more photos depicting people than its carbon-based competitors, flagging 32 pictures featuring people not wearing safety helmets and 106 without high-visibility clothing. The safety experts agreed that an AI like this could help them quickly sort and identify on-site safety hazards which require a more careful review. The availability of software that can automatically sort, filter and extract pertinent features from images strengthens the case for increased onsite photo and video monitoring. Drones, already popular in construction as a way to perform inspections of inaccessible areas, may soon "see" sites as humans haven't been able to, not just from a different angle, but identifying patterns that lead to higher safety risks or impending schedule and cost overruns. And as "smart helmets" such as DAQRI go from prototypes to field-ready devices in the coming years, A.I. image and video recognition tools will assist site inspectors to identify similar hazardous behaviours or conditions in real time. Patterns don't just manifest themselves visually. Most construction management software applications are built on cloud-based platforms that allow users to connect real-time project data to an increasing number of external tools such as document management systems, scheduling, business intelligence and project reporting apps. 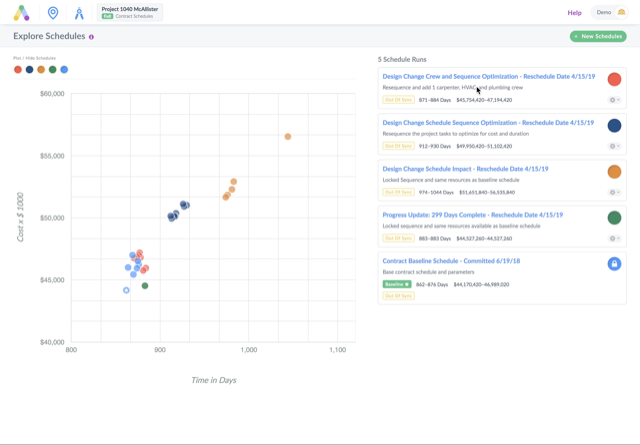 Contractors will soon run machine learning algorithms on their ever-increasing cross-project datasets to identify patterns that humans simply can't - like the effect of model changes by a mechanical designers on schedule delays and cost overruns. On a project level, project managers may want to use AI to search through keywords in digitally documented reports or inspections, to flag potential high-risk observations for urgent resolution. A.I. is starting to see, hear and understand our construction sites, and offer us better insights into how we should be managing them. Contractors can look to other industries to imagine what the next years might hold for the adoption of these tools in construction. The tech giants are already in an all-out A.I. Arms race. Google's CEO recently stated that the world is becoming A.I. first. As algorithms become more fine tuned, companies who successfully implement machine learning to assist project management may significantly reduce risks in key areas like site safety and schedule reliability. They will also inevitably gain key competitive advantages in labour efficiency - A.I., as any new technology, will replace some human workers whether we like it or not. But A.I. won't replace human judgement (yet). Instead it's beginning to assist project managers by uncovering insights that help them make better decisions. The construction site of the (near) future. Picture the scene: as you walk onto the construction site, a drone buzzes overhead. Lasers bounce off every surface.You pull a device out of your pocket to view the latest drawings and fully coordinated 3D models, and record a video to capture progress. As you upload it to the cloud, the objects in the video are automatically recognized and tagged to let other project members quickly find what they need. Nearby, an engineer wearing a smart helmet performs a complex task with the aid of real time information beamed straight onto his field of vision. A few years ago, this scene would have seemed straight out of science-fiction, but it's fast becoming a reality. Digitization vs Digital Transformation. Digitization refers to the conversion analog information into digital form. More broadly, it is the trend turning various aspects of our life into digital data, and transforming this data into new forms of value. The diagram above is an example of an ever increasing amount of real-world objects and activities for which a digital replica is recorded and stored. Throughout human history we've had complex webs of interpersonal connections. But in the last decade, by having hundreds of digitally recorded connections on online social networks like LinkedIn and Facebook, we can visually map the mutual links within our professional or social circles. Digital Transformation is when business activities, processes and models are restructured to fully leverage the opportunities of digital technologies and their impact across society in a strategic and prioritized way. We've begun to realize some early benefits of digital construction through adoption of BIM, project management and mobile collaboration software. Change orders and design errors have been significantly reduced on many projects. But the change we've seen so far has been incremental, not transformational. If you know otherwise, please tell me in the comments below. Projects still overrun deadlines. Project managers still lose sleep. Site workers are still inefficient, and get injured and killed more than in just about any other industry. Contract structures are still combative and litigious. Waste and rework still standard, projects (when profitable) still have razor-thin margins, clients are still often unsatisfied, and the public still views construction as a wasteful, polluting nuisance. And it still is. The wave of transformation in construction will hit when we connect the digital dots. A real step-change in performance will happen once the exponentially-growing digital data streams generated during design, construction and operations start to become interconnected in a meaningful way. The terabytes of images and photogrammetric models captured by drones, mobile devices and scanners. The millions of data points on suppliers', designers' and subcontractors' performance, stored in 3D models and project management software. Growing data-streams from cheap sensors being embedded in building components and wearable technology. Just as manufacturing was transformed when PLM, ERP and CRM created systems of integrated applications to manage production, logistics and demand, construction will see significant improvement as BIM becomes the true information backbone of the jobsite. Data will be analyzed in a way that reveals actionable insights. New types of contracts, procurement models and methods of managing supply chains will develop to facilitate, rather than hinder, adoption of collaborative construction technology and meet clients needs. Technology companies like Autodesk broadly call this Construction in the Era of Connection. In the UK, the term Level 3 BIM is used. In Germany, they refer to Building 4.0. This change will be good for some and painful for others. Many small, hitherto unknown contractors and construction managers who successfully recognize how to get value out of the "I" in BIM will have distinct early-mover advantages. Large, established companies who fail to react, rehire and restructure will be hurt. Whats more, other industries have already begun undergoing this revolution, which could accelerate the rate of change in construction, since we wont need to reinvent the wheel. How can we predict future needs to ship materials to site before they've even been ordered? Ask Amazon. How can humans and robots build something together? Ask Audi. Productivity Improvements. 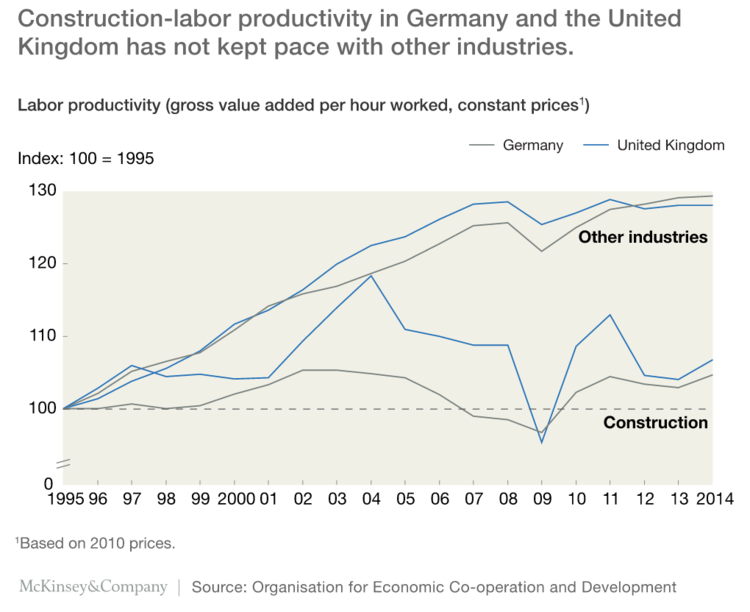 Much of the low productivity in construction is a result of workers spending too much of their time in the field performing non-value adding tasks. Searching or waiting for the latest drawings, photos, statuses of issues, etc. To measure time savings, we need to first set a historical performance baseline. For example, how many hours does it take the typical site supervisor to create his weekly report back in the office after walking the site using a paper clipboard, printed plans and a digital camera? Once we have an estimate, we can then survey workers on changes in weekly durations of tasks. One study conducted by a major US general contractor found that compared to paper-based methods, mobility tools cut out nearly 1 day of non-value adding work per week for site staff, making them 15-20% more productive! Once we have a baseline duration for an activity on similar projects in the past, we can measure schedule improvements against it. For example, if the paper-based commissioning process of a data-center has historically taken 10 weeks, and quicker issue turnaround reduces that to 8 weeks, the task has been compressed by 20%. This means we can hand over the project 2 weeks early, or at least claw back half a month's worth of previous delays. 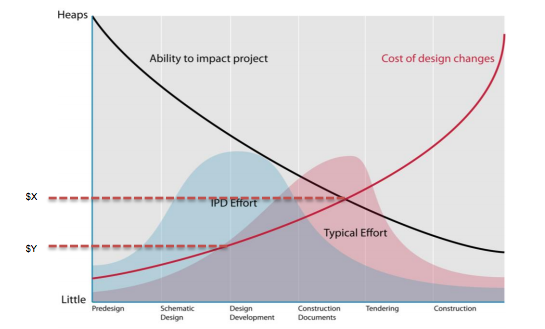 Above is the The MacLeamy Effort Curve: this illustrates the benefits of implementing BIM during the design phase, but its key principle applies equally well to construction: more rigorous, proactive inspections in earlier phases of a project ensure that we ‘nip problems in the bud’ and result in less costly rework issues. In the curve illustrated above, the baseline is $X - the average cost to resolve issues using a traditional process. The reduced total cost is $Y - thanks to earlier issue detection. To see the effects of earlier issue detection in practice, let's consider the example above. We estimate the average cost to resolve an issue (such as a defective masonry joint) by calculating the associated labor, material and rework costs which accumulate over time. The longer an issue goes undetected, the more costly it is to resolve. Thanks to cloud-based mobility tools, subcontractors now have immediate access to up-to date lists of all outstanding items on site. They are notified the issue earlier, and can fix it with less time, effort and cost. By solving issues more quickly, we're also reducing the risk that other trades will install work on top of defects, which would otherwise need to be removed, resulting in costly rework (column furthest to right). By analysing completed project data, we can measure the number of defective items which get escalated to an owners representative. We then multiply this number by the average cost of each overdue issue, to work out the total cost of late issue resolution. Over the course of a live project, we can then track a reduction in the number of these overdue issues, avoiding the costly involvement of more parties as time goes on. Some companies may also keep track of rework as a percentage of total costs, but this information is often sensitive and never openly broadcast! So far, we've talked about how to measure quality, schedule and productivity improvements achieved through using construction mobility software. Now, let's talk about how these benefits can be translated into cost savings, and how these savings can fit into an overall return on investment (ROI) calculation for construction mobility. Contractors and construction managers are now developing strategies for implementing software in a standard way across their business, but doing so without a strategy to track and maximize cost savings leads to sub-optimal results. Translating Improvements into Cost Savings. Good news – once we've measured efficiency gains, schedule acceleration and rework reduction, the hardest part is over! We can now take the values for improvements, and multiply them by various project factors to estimate total cost savings. 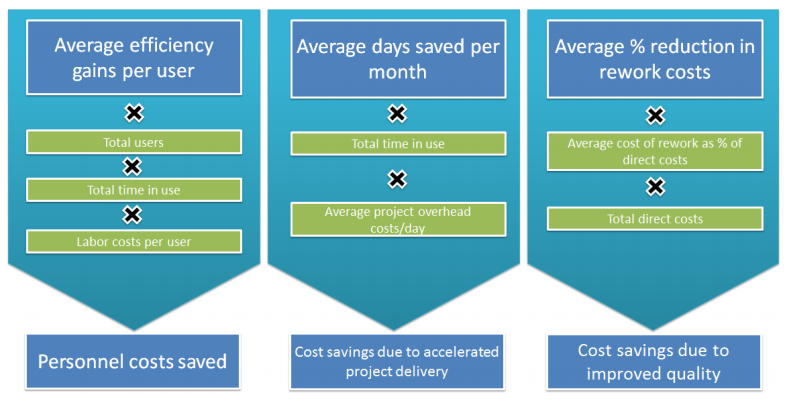 Preliminaries (general conditions) due to less overhead costs as total time on-site to deliver a project becomes shorter, reducing time based variable costs (eg. site offices, security, crane rental). Rework as a percentage of direct costs due to improvements in quality, through better coordination, and earlier issue detection and resolution. A study by a major US general contractor estimated that a project team could avoid up to 1/3 of all rework with an additional 50 hours/week of field supervision & planning, hours which mobility tools can make available by eliminating non-value adding activities. This means that ROI can be calculated differently, depending on how we decide to interpret the cost savings which result from performance improvements. Analysis of project data to identify trends, supply chain performance, problem areas and opportunities for continuous improvement. A future post will be dedicated to discussing the benefits of this analysis. Increased client satisfaction due to reduced waste, improved quality, earlier delivery and more complete information handover creating cost savings later in maintenance and operation. This results in increased repeat business, higher rate of successful project bids, and a lower annual cost of project pursuit. Insurance against claims after project completion due to clear and complete construction documentation. Improved site safety through more rigorous inspections, and the ability to drive down insurance costs by KPIs such as EMR (Experience Modification Rate). For a detailed discussion of how a major US general contractor calculated ROI of construction mobility, watch this video. Construction contractors have begun widespread adoption cloud-based, mobile collaboration software on devices such as iPads to manage information flow on their projects. Most contractors have reported significant improvements. But its hard to quantify these improvements, and there's lack of agreement on how to maximize the benefits. Over the next few weeks, we'll be discussing the details of some practical, proven methods to ensure successful implementation and optimize ROI of these powerful tools. Set goals and track progress. By mapping out each of the the workflows which we want to support and improve using mobility tools, establishing performance baselines and then measuring improvements against them, we're not only tracking the success of the implementation, but can also identifying what's not working, so that we can know what to fix if needed. View a project as a communication network and involve all relevant members. Sure, a tablet can serve as a camera, map, DJ mixer and Pokemon catcher, but mobile handsets were invented as a means to communicate. Yet general contractors who invest in mobility software tend to focus primarily on documenting site conditions, or on internal communication within the construction supervision and management team. They often to neglect the wider network of 3rd party project members such as designers, client representatives and trade subcontractors,who also need to exchange up to date information on a daily basis. The more members of an project team who can access to the latest info when they need it, the greater the benefit of the tool. And by engaging members of an extended supply chain with cloud based software, we collect valuable datasets that can give us insights into performance that were previously not available. Don't forget about staffing, training and IT infrastructure. BIM managers reading this will no doubt agree that their daily routines are busy enough. Don't expect a successful implementation if you just add rolling-out enterprise construction mobility software to a BIM manager's already groaning to-do list. To fully capture the potential benefits of this extremely strategic shift in how projects manage information, assemble a knowledgeable, specialized team who understands business needs, project specific requirements, and can support projects in a standardized way. And don't let a lack of hardware, internet connectivity or user training block adoption.